This is the bluff on which the bird photographers take their photos of the California brown pelicans (Pelecanus occidentalis) in their breeding plumage. Note the distinct absence of photographers — this is unusual and due to the early hour (well before sunrise). I like to get to the bluff very early and watch the birds arrive. More pelicans and cormorants than are seen in this image will arrive soon, to warm themselves on the rocks when the sun hits, and photographers will likely follow. As I recall, on the morning this was taken I was the only person there for quite a while. 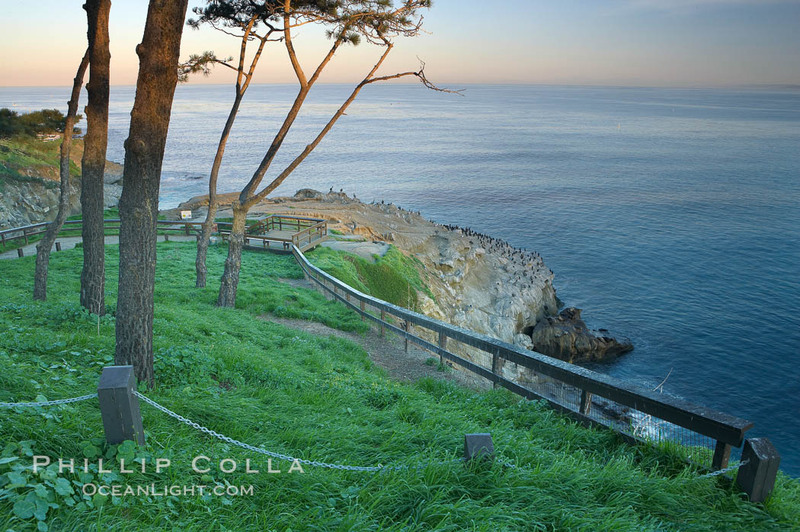 Bluff and trees overlooking the ocean near La Jolla Cove, sunrise.